Other than upgrading to a newer version of the software which is available, there are a few other solutions to this problem, most not terribly desirable. One is to replace the existing PC with a 32-bit version of the same operating system (particularly if it is running Windows 7, 8 or 10). That is an increasingly impractical option. Another is to install a virtual 32-bit environment or emulator. Typically these are fraught with a variety of technical hurdles and are still somewhat awkward to access. While most of our users either have migrated (or will soon will be) to newer Advanced Accounting versions, it can still be desirable to be able to run old programs even if they will not be getting used on a regular basis. In addition, if an older PC fails when the older version was still being routinely run, and the old software is then of necessity migrated to a 64-bit system, the old software may still needs to initially be run in order for the conversion of data from 5.1 to 7i (and soon 8) to take place, plus it may be needed to be used until that can occur. Programmers may also have an occasional need to look at older programs in the TAS 5.1 (or prior) application development system and be able to make program changes and compile older programs from a 64-bit PC. vDos potentially provides a solution for all of the scenarios above. It could even be used for users who would rather fight than switch, the only primary potential problem then would relate to printing. vDos however provides ample support for printing and in fact provides legacy versions with a Windows dialog box that older versions lacked. * The printing options in fact appear to be very powerful including being able to print to a PDF, but would likely require changes to individual programs in order for the output to be properly aligned and formatted correctly in general. The April 2015 version (the October 2015 version has a built-in expiration date) remains available for free. Starting November 1, 2015, the latest version which should be registered but can be downloaded installed without advance payment (and which is no longer 100% open source, an irrelevant fact for most users). Initial setup: Installing vDos initially is simple. The default install folder is C:\vDos. It normally should be installed to a local drive even if the accounting (or other legacy) software is installed on a networked drive, at least for preliminary setup and testing. Folder names and any called file names should be 8.3 compliant. The location of the existing legacy software should already be in a compliant folder name. If located across a network, the user will need the normal read/write/delete rights to the folder. At this point, you should be able to run the vDos software which by default calls an old DataPerfect application as a test. Assuming that runs successfully (press F7 to exit out of that software and type the word EXIT and then press ENTER to exit the session), proceed with next section. 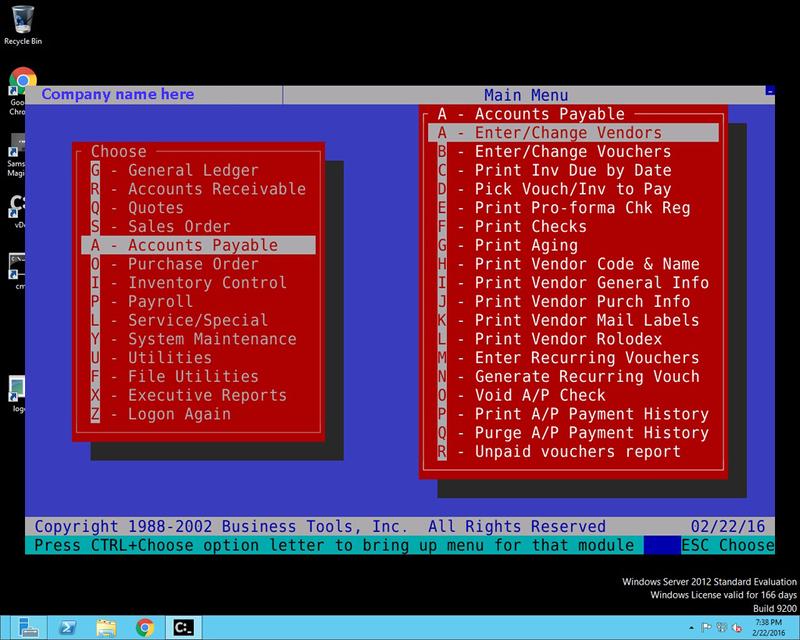 Configuring to run Advanced Accounting: The vDos.exe (executable) creates its own C:\ environment or session, and relies on two files that are initially installed in the same folder as the executable, CONFIG.TXT and AUTOEXEC.TXT. These correspond to the days when CONFIG.SYS and AUTOEXEC.BAT were in the C:\ drive of MS-DOS systems as well as early MS-Windows systems (in later versions of Windows, they were placed in C:\WINDOWS\SYSTEM32 and renamed CONFIG.NT and AUTOEXEC.NT). The shortcut to vDos.exe will automatically process whatever is in the CONFIG.TXT file and call the program specified in AUTOEXEC.TXT as if it was a batch file. While initially that is the most simplistic installation approach, in a multi-user environment or if you will be using vDos.exe to support more than one legacy application from the same desktop, a different and better approach would be to copy the CONFIG.TXT and the AUTOEXEC.TXT to the legacy application's folder, and then in the icon's properties, change the "Start in" folder to match that location. Just remove the REM prior to that line in CONFIG.TXT. Not only does this provide a standard border around the application window and therefore provides for standard window navigation, it also makes the screen behave in a more expected fashion should you attempt to move the title bar/window around with your mouse. Without enabling FRAME=ON, the window wants to move down on the screen to the point where it becomes unusable (at least when accessed remotely). 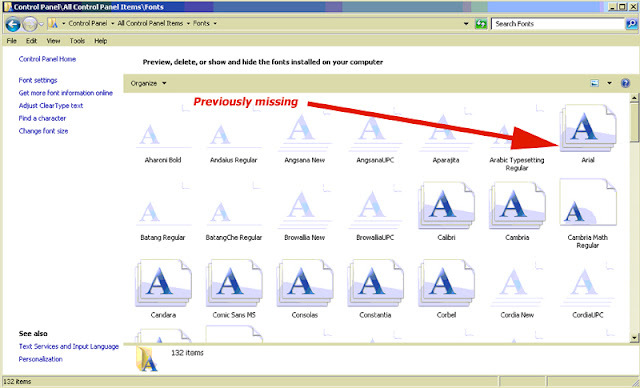 which resides in the same folder where the version 5.0 or 5.1 software is located (i.e. wherever tpc50.exe and dos4g.exe are located). Next edit the AUTOEXEC.TXT file to replace the reference to the demo/test application with calls to run Advanced Accounting. vDos has a USE command that allows you to do something somewhat similar to a NET USE which is handy even if the application is stored on the local drive and not across a network. Keep in mind that you have to move to the application relative to the C:\ session environment you will be in once vDos.exe is called. UNC paths are not normally used with legacy applications, but the vDos USE option allows you to use them in its supported USE statement. So where servername is the Windows server or PC name where the program is installed and adv51 is the name of folder that the program is physically installed under, you might assign drive Z: (which does not have to match physical drive mappings, but is preferable) as follows in the AUTOEXEC.TXT file. If needed, you could include "change directory" commands to move to a folder if the USE statement referred to a folder above where the software was installed, e.g. Note: while not required, it is best to use the same drive letter as any existing drive map to the same folder, or to at least not use conflicting drive letters to avoid not only confusing Windows but also yourself and anyone else who is responsible for maintaining the system at a later date. Put comments in the TXT file to explain what was done, and why. Next use the CALL statement to either call the normal Advanced Accounting batch file or the related executable directly as outlined below. You could also establish SET TAS50= or PATH= values as needed. To avoid having to type EXIT to return to the desktop, simply remove the rem before the word EXIT at the end of the AUTOEXEC.TXT file. There is one additional property that we have found needs to be made and one that is commonly made with legacy programs: right click on the vDos desktop icon, choose Properties, click on Advanced, click on the "Run as administrator" option to check it if not already checked, then click on the OK button and then OK again. it will relate to the "run as administrator" icon property above which will likely be needed even if you are logged in as administrator to the local PC. files that tell vDos what application to run. vDos is an excellent product that we would recommend especially to bridge the gap in situations involving PC migration as well as for archival reference. 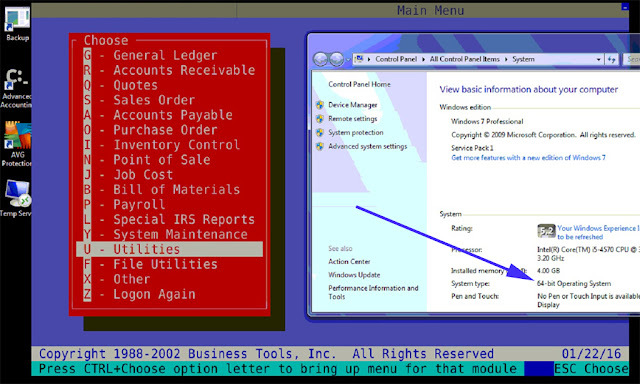 Unlike in some simulated environments, all screens and screen characters appear normally and all of the important keystroke combinations that Advanced Accounting uses (function keys, ESC, Home, End, Page Up, Page Down, booster key combinations such Alt-1, Alt-F1, Ctrl-Page Down, etc.) all appear to be properly supported. vDos documentation claims to be capable of full multi-user access and so could be used to support live production environments (which we have not tested). Running from across a network, it may be a little more sluggish than running from a 32-bit PC directly, but not unacceptably slow. vDos supports some interesting printing enhancements although it may be possible to fully reap the benefits of those without some reprogramming of existing Advanced Accounting 5.1 (or prior) report layouts and related code. Using this as the sole solution for moving forward into the 64-bit world is probably not realistic in the long term for most users: upgrading to the newer versions of the accounting software would normally be the better long term option for Advanced Accounting users. On balance, however, vDos is highly configurable and is seemingly a very valuable tool that could have many uses. 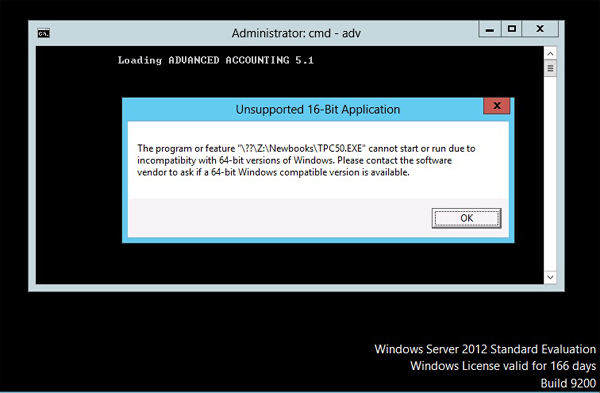 Note: our preliminary succesful testing on two different systems (Win Pro 7 64-bit and Server 2012 64-bit) was solely with the Btrieve 5.10a TSR as distributed and provided by the original publisher of Advanced Accounting 5.1, TAS Professional 5.1, and predecessor products. An attempt was made to use a Pervasive 11 workgroup engine on a third system, but that does not appear to be possible. While modern Pervasive engines do provide "DOS Box" support, that support appears to be unavailable when using vDos, which is instead attempting to run the application in a largely different environment; it is largely not integrated with the Windows operating system and does not therefore support DEVICE= statements in its CONFIG.TXT file, etc. A long-time user contacted us today about migrating their Advanced Accounting 6.x system to a newer operating system on an also newly purchase computer. They wondered whether the newer update that is available would fix a problem with both screen and printing having become excessively small and hard to read since making that change. The "bitness" of the operating system of course had nothing to do with this issue; it was one we haven't seen before, but which many computer users have reported experiencing: a missing Arial font installation. This above is not what it normally looks like. Note the almost unreadable text starting with the Continue button and the rest of that screen. 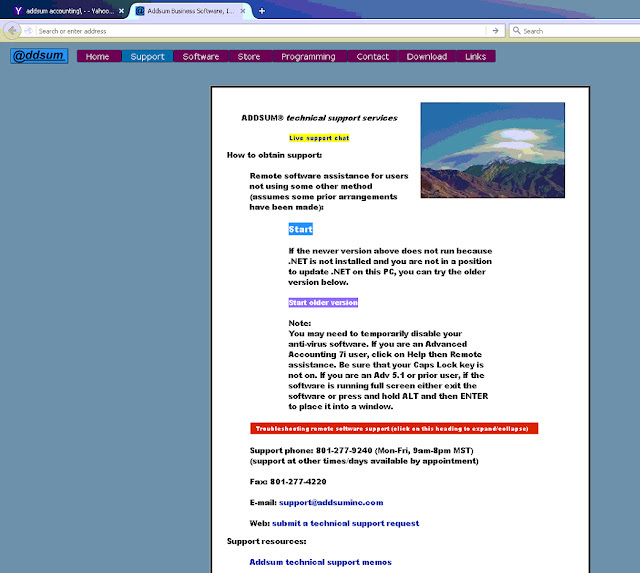 Entry fields within the software were also very small and hard to read. Because it is a standard font that is normally installed with all Windows installations, the most common font used in Advanced Accounting 6 and now 7i (and this will be true with the next release as well) is Arial (although it is not the only one). When a font that is specified by an installed program is missing (including in web pages), the operating system attempts to find the closest available match, but the results can be unpredictable. In checking installed fonts on this PC, there was no Arial. After installing Microsoft's European Union Expansion Font Update which includes an updated version of Arial (along with Times New Roman, Trebuchet and Verdana), the problem was immediately solved, and without the need for a reboot.